Fig. 1: Young investigator award 1988 with Thomas F. Lüscher as runner up (left) for an abstract published later in the New England Journal of Medicine (1988; 319: 462-7). Under his leadership, the Working Group actively participated in the Programme Committee by submitting proposals for pre-arranged sessions, published statements of the Working Group and organized small expert meetings. With Udo Sechtem as the then Chairman of the Congress Programme Committee, Thomas F. Lüscher participated in the selection of pre-arranged sessions and the organisation of the oral and poster sessions, mainly in the topics basic science, coronary artery disease and intervention. Under the leadership of Thomas F. Lüscher the most successful congresses were held in Stockholm in 2001 and in Berlin in 2002 (Fig. : 2) with every increasing attendence. Fig. 2: ESC Congress 2001 in Stockholm and 2002 in Berlin. Together with his predecessor Udo Sechtem Thomas F. Lüscher introduced the Highlight Session, now a tradition at the end of every Annual Congress, the Focus Clinical Practice and the Clinical Trial Update Session, both still successful features of each Annual Congress of the European Society of Cardiology. Furthermore, basic science was promoted through the introduction of special pre-arranged sessions and featured research sessions. Under the presidency of Jean-Pierre Bassand the structure of the European Society was reorganized by the Vice-President of the Working Groups Thomas F. Lüscher (Fig. 3). During that process some of the Working Groups were promoted or merged into Associations such as the European Heart Rhythm Association, the European Heart Failure Association among others, giving rise to the current structure of the European Society of Cardiology with 5 Associations and 12 Working Groups. Fig. 3: ESC Board 2002-2004. Under the leadership of the chairman and past-president Mihkal Tandera Thomas F. Lüscher served as a member of the nominating committee that selected the candidates for the presidential election 2008 eventually proposing Michel Komajda as president-elect and new members of the Board for 2008 – 2010. In 2004 the Board of the European Society of Cardiology under the leadership of the then president Maarten L. Simoons decided to edit a European textbook of cardiovascular medicine. The board nominated John A. Camm, Thomas F. Lüscher and Patrick W. Serruys as editors and choose Blackwell, Oxford as the publisher. The first ESC Textbook of Cardiovascular Medicine appeared in 2005 in print (Fig. 4) and as an electronic web-based version and was a remarkable success with almost 20’000 copies sold in different languages other than English such as Polish, Italian and Turkish.In 2009 the second edition appeared with the same editors, but in part different authors of the various chapters with now Oxford University Press as the publisher (Fig. 4). Fig. 4: ESC Textbook of Cardiovascular Medicine. The European Society of Cardiology supports a series of ESC Update Courses in Davos, Rome and Dubrovnik. The course in Davos is by far the oldest and most established with around 70 faculty members from Europe and the US and more than 500 participants from 41 countries (Fig. 5; see also www.cardiologyupdate.ch). Fig. 5: Cardiology Update 2017. At the Annual Congress of the European Society of Cardiology in Vienna in 2008, Thomas F. Lüscher had the honour to give the Andreas-Grüntzig-Lecture in recognition of his contribution to Cardiology (Fig. 6). Among a large number of candidates, Thomas F. Lüscher was nominated by the search committee (consisting of Kim Fox, President of the European Society of Cardiology, Mihkal Tandera, Alan Howard, then CEO of the European Heart House and Keith McGregor, Officer in Charge of Publications at the European Heart House) as editor-in-chief of the European Heart Journal (Fig. : 7) for a three year term that was prolonged for several more periods up to today. Thomas F. Lüscher nominated 5 deputy editors and 18 associate editors as well as statistical editors to run the journal. The editorial office is located at the Zurich Heart House. 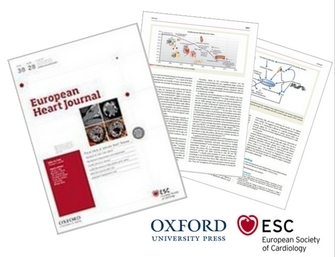 In its inaugurational editorial he outlined the strategy of the new European Heart Journal: “The European Heart Journal goes global!” This ambitious strategy involved substantial changes with an US Deputy Editor (Bernard Gersh) and numerous international editors from North America, Asia and Australia, new features such as CardioPulse (Managing Editor Andros Tofield), invited reviews by key-opinion-leaders illustrated with designer figures, ESC Hotline Fasttrack and ESC Clinical Trial Update Fasttracks published online at the ESC Annual Congress with Editorials by the discussants, Basic Science Fasttrack, e-letters and overall research papers of high scientific quality. Furthermore, he introduced the manuscript tranfer within the ESC journal family. Under his leadership the number of submitted manuscripts as well as the impact factor of the European Heart Journal rose further. As ex officio member of the current board, Thomas F. Lüscher takes part in all the meetings and contributes to the discussions and decisions on pertinent issues of European Cardiology.